Peaches are in season which means that you can find me eating peaches on everything!! 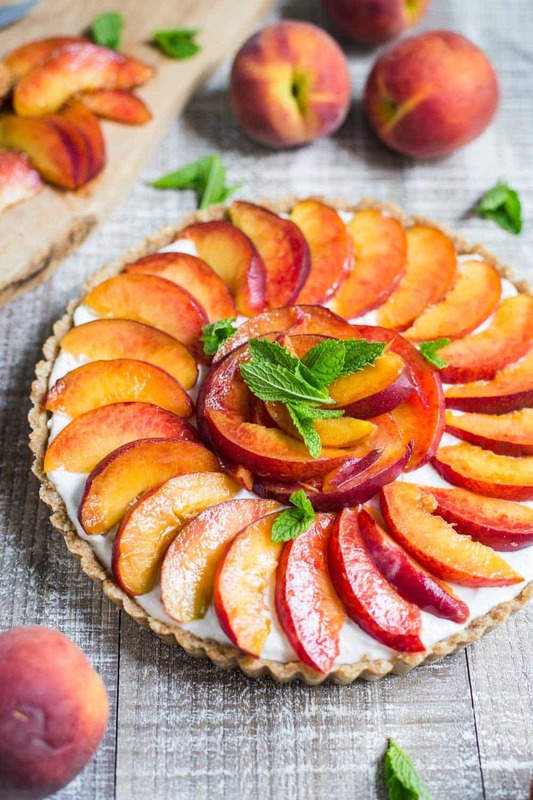 On top of my oatmeal, in my smoothie bowl, by themselves, and of course, on top of this super easy No Bake Peach Pie! In case you didn’t know, I’m a HUGE fan of no bake pies. Anytime I can stir a few ingredients together, pour it in a crust, throw it in the fridge, and dessert is magically ready, I’m down! 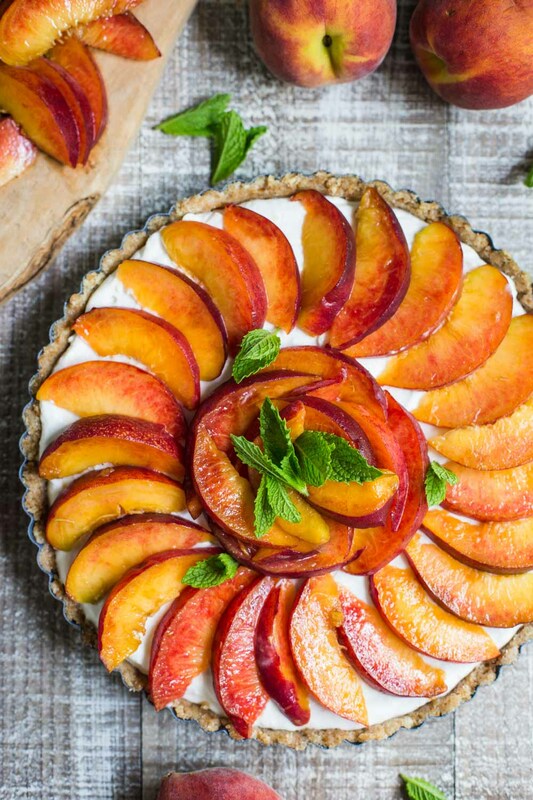 In this case, we’re also topping it with PEACHES because I literally canNOT get enough of them this year. There’s a place here in Nashville called the peach truck that ships peaches in from Georgia. They pick the peaches off of the trees and then have them ready to buy the very next day. I think it’s safe to say that I’ve been their #1 customer this year. This pie is my version of a Vegan Ice Box Pie. That’s the vibe we’re going for with this delicious dessert. The crust for this pie is basically the same as the pie crust that I used for my Vegan Peanut Butter Pie except I used a bit more almond flour and omitted the cocoa powder. Once all of the ingredients are mixed together, you’re left with a nice sticky dough that presses into the bottom of the pan very easily and once hardened in the fridge, is perfect for any pie! Plus, hello! It’s no bake which I love. The filling is a pretty simple coconut whip filling that’s mixed with a bit of lemon and some maple syrup for sweetness. Once the filling is poured in the crust, the whole pie is put in the fridge or freezer to chill out for a bit. Just before I’m ready to take the pie out and serve it, I slice my peaches rather thin (I got about 16 slices per peach) and arrange them all pretty like on top of the pie. I topped it off with a little bit of mint but mostly just because I have a ridiculous amount of it growing in my garden right now. ^^^^^Isn’t it so pretty!!? 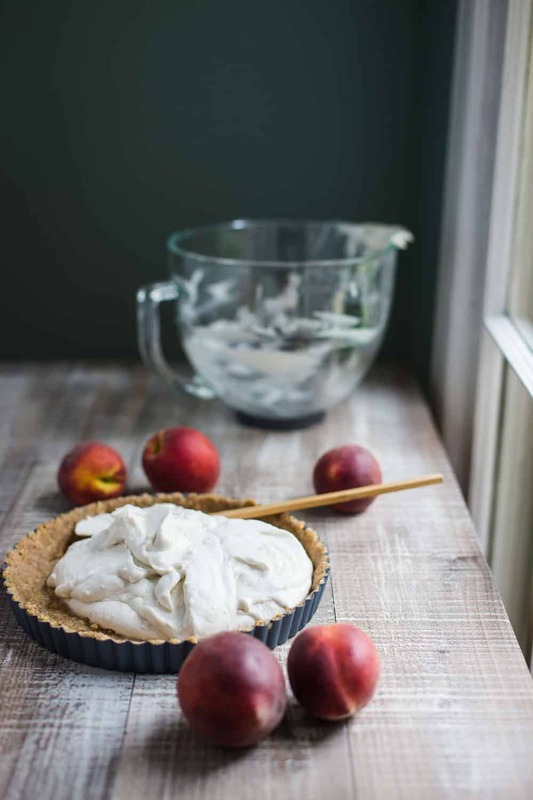 I’m really happy with how this pie turned out :) I debated cooking the peaches a bit (but then it wouldn’t have really been no bake) and I also thought about mixing the peaches with a bit of sugar but decided against that as well. 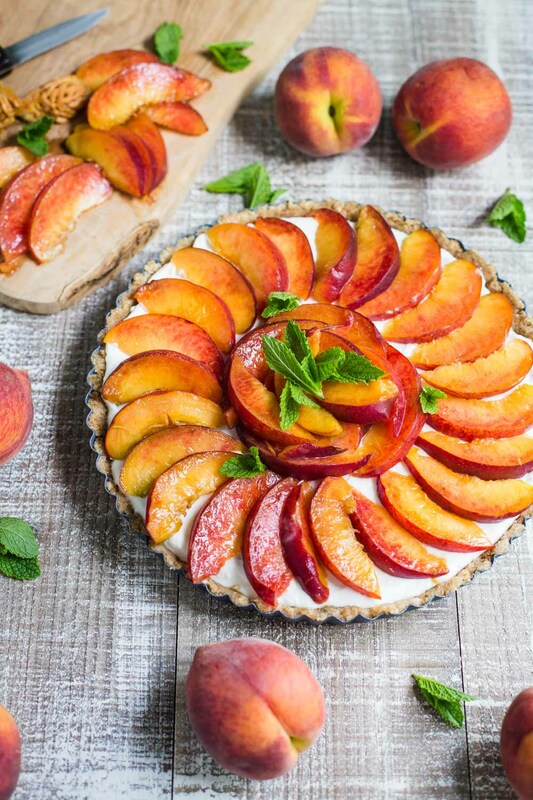 In the end, the raw peaches on the pie are heavenly and I’m SO so happy with how this turned out! In a large bowl, stir together all of the crust ingredients until well combined. Press the mixture into the bottom of a round pie/ tart pan. I made a more traditional crust with mine but you could also spread it all into the bottom if you don’t want sides to the crust. Place in the freezer to harden while you prepare the rest of the pie (can sit in the fridge/ freezer overnight if desired). Scrap the coconut cream out of the can, leaving the liquid/ water behind for use in other recipes (or discard). Place the cream in the bowl of a stand mixer (you can also use a hand mixer for this) and whisk until it begins to really thicken and peaks being to form. Fold in the syrup, and the lemon juice and zest. The mixture might seem a bit too runny at this point but have no fear, it’ll harden right up in the fridge. Pour the mixture into your crust and place in the fridge for at least an hour (but can be much longer). 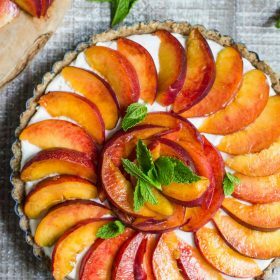 When you’re ready to serve, top with thinly sliced peaches arranged neatly and a bit of mint placed around the pie (mostly to add a nice pop of color!). Serve and ENJOY!! 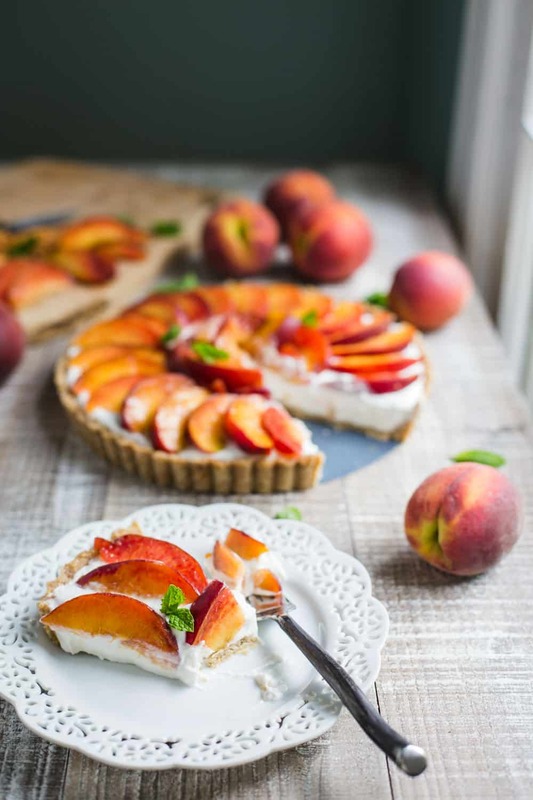 Please note that this pie doesn’t last too long since it has the fresh peaches on top. I would do your best to finish it off within 48 hours (trust me, that won’t be hard). THis looks SO good! I am definitely going to try this recipe :) The photos are just gorgeous. So happy stone fruit season is here! That looks delicious! I love peaches! Made this tonight, it was delish but runny. One of my cans of coconut milk didn’t solidly in the frig and I didn’t drain any of the liquid as I figured it would become firm in the freezer. It looked so good we couldnt wait for it to freeze solid so after an hour so we ate it out of the pan! It was soupy but oh so good! Especially the crust, I’m not a baker so had never used almond flour. Let’s just say I’m a fan! This looks amazing!!!! I’m very impressed! Stumbled on this at Tastespotting and I fell in love with it. This recipe is really classy. I love it. Hi! Question, are you sure it’s coconut milk? Not coconut cream? Tnx!